Shown L-R: Derek Snyder, GC Pro Western Regional Manager; Steven Slate, co-inventor/CEO, Slate Pro Audio; Alex Oana, co-inventor/V.P. of Creative Operations, Slate Pro Audio; and Rick Plushner, GC Pro Vice President. WESTLAKE VILLAGE, CA, January 24, 2013 — Guitar Center Professional (GC Pro), the outside sales division of Guitar Center that focuses on the needs of professional users, has been named the exclusive U.S. dealer of the RAVEN MTX Multi-Touch Production Console by Slate Pro Audio. Introduced at the 133rd AES convention in San Francisco, the RAVEN MTX enjoyed an overwhelmingly positive response, as engineers were treated to the unveiling of a truly groundbreaking, next-generation audio console. The RAVEN MTX Multi-Touch Production Console is the ultimate centerpiece for the modern studio, combining a state-of-the-art multi-touch monitor, feature-rich multi-touch DAW control software, and a world-class digitally controlled analog monitor section. The console will be available through GC Pro’s 43 nationwide locations, and eight selected locations will serve as product demo sites for the RAVEN MTX. 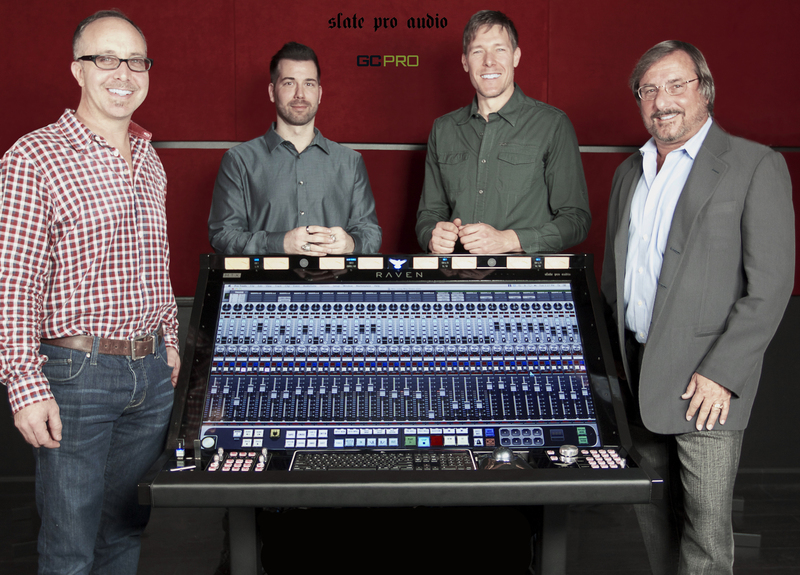 Photo Caption: Shown L-R: Derek Snyder, GC Pro Western Regional Manager; Steven Slate, co-inventor/CEO, Slate Pro Audio; Alex Oana, co-inventor/V.P. of Creative Operations, Slate Pro Audio; and Rick Plushner, GC Pro Vice President. Guitar Center is the leading United States retailer of guitars, amplifiers, percussion, keyboards and pro-audio and recording equipment. Our retail store subsidiary operates 241 Guitar Center stores across the United States. In addition, our Music & Arts division operates 101 retail stores specializing in band and orchestra instruments for sale and rental, serving teachers, band directors, college professors and students. We also are the largest direct response retailer of musical instruments and related products in the United States through our wholly owned subsidiary; Musician’s Friend, Inc., and its catalogs and owned or operated websites. More information on Guitar Center can be found by visiting the Company’s website at www.guitarcenter.com.